Locked accessible gate?, originally uploaded by MammonLord. 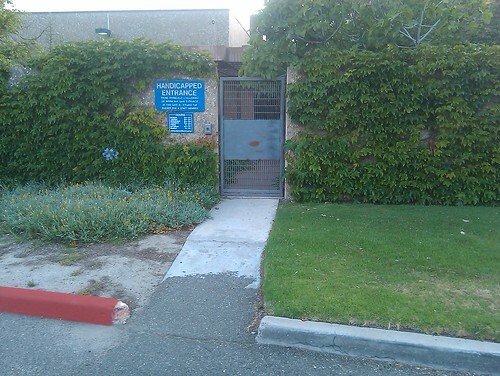 The marked accessible entrance to this building has a locked gate between the road and the door. The real kicker is that the main entrance is more accessible than this one. It’s yet another example of an incomplete understanding of the law. Clearly the owners “knew” they needed an accessible entrance, but thought it should be separate. It is almost always best to make your main entrance the accessible entry. This is the second video in a series of videos which give access tips. In this video we speak of more specific parking details. It builds on the last video which is about how to decide where to place accessible parking in the first place. Don’t let your business get caught with these liability issues. Access helps everyone! This is the first video in a series of videos which give access tips. Stay tuned for more! By Phillip K. Cha, Esq. While the ADA imposes legal obligations on a business regarding providing access to the disabled public (usually its customers or clients), it also creates obligations between a business and its disabled employees. While these obligations are addressed in separate sections of the ADA (Title I addresses private employers, whereas Title III addresses public accommodations) and involve different legal issues, there are some significant areas of overlap that should not be ignored. Importantly, the ADA may require that a business take additional steps above and beyond removing access barriers for the public to ensure that its employees also are provided equal access to facilities. To illustrate, under Title I, an employer is required to provide “reasonable accommodations” to qualified individuals with a disability. 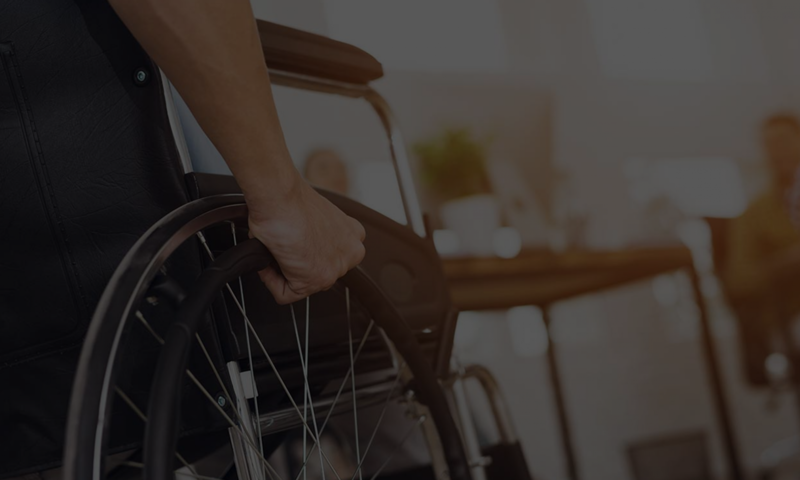 The ADA regulations identify various types of reasonable accommodations, including retrofitting, to allow disabled employees to enjoy the same benefits and privileges as those enjoyed by non-disabled employees. Specific examples of reasonable accommodations, much like those that may be required under Title III, include installing wheelchair ramps and proper signage. This requirement applies to both work-related and non-work facilities provided or maintained by the employer for use by employees, including break rooms, restrooms, lunch rooms and training rooms, which might not otherwise be open to the general public. In light of the interplay between Titles I and III, any ADA compliance plan should account for the company’s obligations as a provider of public accommodations, as well as an employer. Failure to wear both hats in going through this process may expose a business to substantial liability under the ADA and State law. Phillip K. Cha is a labor and employment law attorney with Swerdlow Florence Sanchez Swerdlow & Wimmer in Beverly Hills, California. If you have any questions about the ADA as it applies to employers, feel free to give Phillip a call at (310) 288-3980 or e-mail him at pcha@swerdlowlaw.com. Below is a short quiz (geared for California Access Requirements) that you can take to assess your site’s general accessibility. Be aware that access is determined by far more complicated features. One of the most often-overlooked facets of Americans with Disabilities Act (ADA) compliance is the door. While parking, restrooms and signage are all notorious for their complexities, doors remain on top of the list for the California Building Code (CBC) of priorities for removing architectural barriers. This is because while restrooms are often the site of accessibility lawsuits (for reasons we can get into in another article), and parking lots are highly visible, doors are the only architectural barrier which can single-handedly stop someone from entering a site. They can also be a direct source of injury if the door closes too quickly or is so heavy that it pushes one off-balance. Fortunately, it is relatively inexpensive to improve your door’s accessibility, especially considering the benefits that it confers to all of your customers, and even the psychological impression that an easy or difficult entrance to your business can impart. In general, the path of travel requires what is called a pedestrian envelope. This means that as a person travels through a site (with or without a mobility aid), there needs to be a hazard-free zone surrounding them. Some of these requirements include edge protection, lack of protruding objects, lack of slopes and cross-slopes and clear vertical head-space. What often gets missed is that such requirements also extend through the doorway. Already the door has many requirements unique to itself as an architectural component. Between the ADA and the CBC there are almost 60 unique facets of a doorway each. But between the two (one a set of civil rights laws with building code, the other a set of building codes), almost 30 (depending on interpretation) of the door requirements are shared. While many of these don’t apply to every door, some common requirements that do apply are to further ensure that the pedestrian envelope continues uninterrupted through the door way. The door closer should always have its equipment above 80 inches. Since commercial doors are often at 80 inches, to have the door closer arm extend under the doorway is a violation of the ADA. While not all commercial doors are required to be accessible, as there can be multiple entrances to an area, or entrances to areas not serving the public within an employee area, doors that are accessible should be marked accessible when there are doors that are not accessible. Thus door closers that go around the door-frame are preferred. Door closers are a requirement for single user restrooms, so pay close attention to them. Another common requirement for door closers is the closing time. Doors that are self closing, such as those in restroom stalls, are required to take at least 3 seconds to close when held at a 70 degree position [diagram]. Door closers should also be adjusted so as to require less than 5 pounds of pressure. Along with these height requirements there are also threshold requirements. The ADA and CBC both allow for a maximum threshold height of ½ inches above the landing on either side if the threshold is beveled, ¼ inches if the threshold is not. What is unstated in both and not allowed are horizontal gaps under the doorway of greater than ½ inches measured in the direction of travel. While the pedestrian envelope constitutes one of the little understood applications of the code to doors, door usage goes beyond the code requirements. Such knowledge requires a grasp of how the principles of the ADA apply to actual individuals using a given door. Door hardware and door latch side clearances are two of such issues. Door hardware constitutes one of the readily achievable facets of ADA compliance. We are all familiar with the requirements of door usage — single knobs are no longer allowed. What is often missed is the door latch (which in commercial doors can be at the bottom of the door) or the older style thumb-latch door handles. Although not specifically mentioned, the use of a thumb with a pulling motion falls under the rubric of a complex twisting and grasping action which both the ADA and CBC outlaw. Another set of requirements for the door which presents confusion involves the side clearances at doorways. These clearances are essential to aid individuals using a mobility aid (such as a walker) in operating a door. Wheelchair-using individuals and even parents with children inside strollers require level side clearances so they can get the leverage to pull open a door. This space allows individuals to open the door without the added difficulty of moving backwards to make way for the door swing. There are often a series of solutions that are co-present with solving latch side door clearances. The most expensive but most encompassing is the installation of an automatic door opening device. Alternative fixes would include reversing the door swing or moving it from one side to the other in order to comply with latch side clearances. This of course, relies on knowledge about the local building code requirements on your building and about the different approach requirements to your door way. Finally, the latch side clearances also constitute a usable space within a path of travel. Often, fire extinguishers are placed there for convenience, blocking usage of that space. Protruding object fire extinguishers can be made to no longer be protruding objects by having the lowest edge mounted below 27 inches, or by placing furniture or detectable warnings under them. But these solutions to removing the hazard of a protruding object would only interfere with the clear floor space, making the door less usage or even unusable for individuals with mobility impairments. Further investigation is required per site. These are only some of the common considerations for doorway accessibility. Doors are often taken for granted, as people think the width is the only requirement. Doors constitute the single most important architectural barrier as an inaccessible main entrance means that any work done — whether it be with the restroom, the lobby, any common areas or even in the parking lot can become pointless if your customer cannot enter your business in the first place. Improving the accessibility of your business may seem like an expensive endeavor, but with the right expertise, you can save both time and thousands of dollars from unnecessary construction. Make it easier, not harder, for your customers to come inside to your store. For any questions or assistance in improving your accessibility, call us today at 866-982-3212 or email us at help@accesssolutionllc.com. Note: Many of these codes are subject to interpretation and may not reflect the latest versions applicable, especially in the case of official DSA Interpretations or Addendums. ICC/ANSI codes have been omitted. This list does not accurately reflect the full scope of methodology used by YTA and is published for informational purposes only. 1133B.1.1.2 This nonaccessible exit does not have a directional sign. 4.1.2(7)(c) This entrance is not accessible. 1133B.2.6 The bottom 10 inches of the door creates a hazardous condition. 1133B.2.4.2 and Figure 11B-26A(a) There is not enough latchside clearance on the inside of the door. 1133B.2.5.1 The door closes too fast. 4.13.10 The door closes too fast. 1133B.2.5.1 The door does not close. 4.13.10 The door does not close. 1117B.5.2 The symbol on this door for the restroom is not of contrasting colors. 1115B.6 There is no symbol on this door for the restroom. 1133B.2.4.4 There is not enough room inside this vestibule for doors in series. 4.13.7 There is not enough room inside this vestibule for doors in series. 1008.1.2 and 1133B.2.5.2 The door hardware is not mounted at an accessible height. 4.13.9 The door hardware is not mounted at an accessible height. 1133B.2.5.2.c The vertical actuation bars outside the door are not at the required height. 1133B.2.5.2.c One or more controls operating this automatic door do not have a level clear floor space centering on the automated controls. 1117B.5.8.1, 1117B.5.5.3, 1133B.2.5.2.e, and 1133B.2.5.2.c One or more controls operating this automatic door are missing the full sized International Symbol of Accessibility. 1133B.2.5.c One or more controls operating this automatic door are not placed in a conspicuous location. 1133B.2.5.2.c The higher push plate inside this door is not the required height. 1133B.2.5.2.c The push plate operating the auto door outside this door does not open the door or there is only one push plate. 1133B.2.5.2 The door hardware is not accessible. 4.13.9 The door hardware is not accessible. 1133B.2.2 and 1133B.8.6.2 The door is too low. 4.4.2 The door is too low. 4.13.6 and Fig 25(b) and Fig 25(c) The Inside landing length is too shallow. 1133B.2.5.3 There is not enough latchside clearance on the inside of the door due to the alcove. 1133B.2.4.2 The inside landing slope is too great. 4.13.6 The inside landing slope is too great. 1133B.2.4.3, 1133B.2.4.5 and 1133B.2.5.3 The inside latch side clearance is too narrow. 1133B.2.4.2 The inside landing is too short. 4.13.6 and Fig 25(a) The Inside latch side clearance is too narrow. 1133B.2.4.2 and Figure 11B-26A(b) There is not enough width on the inside door landing. 1133B.2.4 There is no landing inside this door. 4.13.6 There is no landing inside this door. 1117B.5.2, 1117B.5.5, 1117B.5.5.4 and 1117B.5.8.1.3 The International Symbol of Accessibility on this entrance is not readily visible from the entrance to individuals with vision impairment. 4.1.2(7)(c) and 4.1and 4.30.5 The International Symbol of Accessibility on this entrance is not readily visible from the entrance to individuals with vision impairment. 1133B.2.5.2 The door latch is not accessible. 4.13.9 The door latch is not accessible. 1133B.2.5.3 There is not enough latchside clearance on the outside of the door due to the alcove. 1133B.2.4.2 and Figure 11B-26A(c) There is not enough latchside clearance on the inside of the door. 1133B.2.4.2 The outside landing slope is too great. 4.13.6 The outside landing slope is too great. 1133B.2.4.3, 1133B.2.4.5 and 1133B.2.5.3 The outside latch side clearance is too narrow. 1133B.2.4.2 The outside landing is too short. 1133B.2.4.2 and Figure 11B-26A(b) There is not enough width on the outside door landing. 1133B.2.4 There is no landing outside this door. 4.13.6 There is no landing outside this door. 1115B.3.2.7 and 1117B.6 The privacy latch is not accessible. 4.13.9 The privacy latch is not accessible. 1115B.3.2.7 and 1117B.6 The privacy latch is too high. 4.13.9 The door hardware is not mounted at an accessible height. 1115B.6.1 The sign on the door does not correctly identify the proper designation of this restroom. 1133B.2.5 The door pressure is too great. 4.13.11(2) The door pressure is too great. 1117B.5.7 There is no Braille on this sign. 4.30.4 There is no Braille on this sign. 1117B.5.7 The sign is too close to the door swing. 4.30.5 The sign is too close to the door swing. 1117B.5.7 The sign for this door is mounted too low. 4.30.6 The sign for this door is mounted too low. 1117B.5.5.4 The posted International Symbol of Accessibility on this entrance is too small. 4.30.4 The posted International Symbol of Accessibility on this entrance is too small. 1117B.5.8.1.2 There is no International Symbol of Accessibility on this entrance. 4.1.2(7)(c) and 4.1and 4.30.7 There is no International Symbol of Accessibility on this entrance. 1117B.5.5 The sign has no raised lettering. 4.30.4 The sign has no raised lettering. 1117B.5.2 and 1117B.5.7 The sign is not easily visible to individuals with vision impairment. 1117B.5.1 There is no sign on the latch side marking the usage of the permanent space behind this door. 4.30.1 and 4.1.3(7) There is no sign on the latch side marking the usage of the permanent space behind this door. 1133B.2.4.2 and Figure 11B-33 The sliding door is flush with the frame. 4.13.9 The sliding door is flush with the frame. 1133B.2.4.1 This threshold at the door is too high. 4.5.2 and 4.13.8 This threshold at the door is too high. 1124B.4 The gap in the path of travel is too great. 4.5.2 and 4.13.8 The gap in the path of travel is too great. 1133B.2.3.3 A revolving door is an entrance. 4.13.2 A revolving door is an entrance. 1133B.2.3.4 A turnstile, rail or another kind of pedestrian control is the only path of travel. A turnstile, rail or another kind of pedestrian control is the only path of travel. 1133B.2.2 The door is too narrow. 4.13.5 The door is too narrow. 4.13.6 and Fig 25(a) The inside latch side clearance is too narrow. 4.13.6 and Fig 25(b) The Inside landing width is too narrow. 4.13.6 and Fig 25(b) and Fig 25(c) The outside landing length is too shallow. 4.13.6 and Fig 25(a) The outside latch side clearance is too narrow. 4.13.6 and Fig 25(b) The outside landing width is too narrow. 4.13.2 A turnstile is an entrance. 4.13.7 The doors in this vestibule swing towards each other. How liable does this make you? Read our ADA FAQ for more information. For information about assessing your site yourself or hiring an ADA expert, please look at our ADA Consultation page. Accessible signage can be extremely difficult to achieve if you don’t know what is required and what is not required. This is especially important if you are ordering custom signage that is both compliant with California Title 24 and looks good in your store! The above unisex restroom sign is a great example of a sign that looks great, but actually has unnecessary elements. Consider the use of this sign: It is to be mounted on the restroom’s door, which is usually the only entrance and exit for the restroom. Question: Why does this sign need Braille, “RESTROOM” in tactile (touchable) lettering and the ISA (International Symbol of Access, or the wheelchair symbol) on it? Answer: It doesn’t need any of it. Putting Braille and tactile lettering on a door that constantly opens and closes without warning can be a safety risk for a visually-impaired person trying to read the sign. By law, you need all of this on a separate sign, mounted next to the door’s latch-side. By placing it there, someone can feel and read the Braille and raised, tactile lettering without having to worry about getting the door slammed on them. Also, the word “RESTROOM” and the ISA are not required on a door sign (though it can be helpful). The ISA can either be on the door or the latch sign. Now that we’ve covered the door sign, let’s take a look at the latch-side restroom sign. All of your accessible features should be featured on it, and also note the difference between latch-side and strike-side of a door: latch-side is where the door’s handle and closing latch are located, while the strike-side has the door’s hinges and the door will strike the wall when fully extended. There are specifications for the Braille and tactile lettering as well.The example on the right is generally what you’d be looking for in a latch-side restroom sign, but it is by no means the only style of sign you can install. One thing you must keep in mind, however, is that tactile text must be uppercase. One of the best designers of accessible signs that we’ve ever seen is H. Toji & Company. Sharon Toji, a principal of the company, is one of the nation’s most qualified experts on accessible sign design and is a voting delegate to the American National Standards Institute (ANSI) that writes accessiblity standards used by the International Building Code and are the basis for the ADA Accessibility Guidelines (ADAAG). She is also a member of the Access Advisory Committee to the California State Building Standards Commission, among others. H. Toji & Company offers customizable signs with a wide selection of fonts, decorations and shapes, and have incorporated numerous features such as inlaid lettering and beveled edges that increase the sign’s durability, longevity and readability. If you are in need of accessible signage for your business, you cannot go wrong with signs from this company. Read our ADA FAQ for more information on general liability. For information about assessing your site yourself or hiring an ADA expert, please look at our ADA Consultation page. Or, give us a call at (866) 982-3212 or email us at help@accesssolutionllc.com and we can consult with you to determine your full accessibility needs, and refer you to Sharon Toji for any custom sign design specifications that you need. Many business owners are unaware of the thousands of possible accessibility barriers that can occur. Fortunately, many of them are simple and easy to address with little time or cost. Here are six tips from Yours Truly Accessibility that can greatly reduce your liability in minutes. All business entrances are required to have an ISA logo (International Symbol of Access) displayed in contrasting colors. There is no “certification” required to post this on your front window. Placement of this can be anywhere near or on the entrance door. Be sure not to place this sign where the sign will blend in with the surrounding surface! That defeats the purpose of having the sign. This sign should be filled in and present at every entrance of the parking with the relevant information regarding disabled parking (telephone number and the location or entity where the car is kept… usually this is the police station). This is one of the most common missing signs in parking lots, and is necessary to prevent disabled parking from being unfairly occupied. Unsecured floor mats, while tidy, are also a source of trips and falls by people using walkers and canes, especially if they tend to shuffle their feet. These should be attached to the ground with industrial-strength adhesive to avoid bunching up, or simply removed to eliminate liability. The key here is ‘equal access.’ If restroom mirrors are placed too high (over 40 inches from floor to bottom edge), they are considered discriminatory. Either remounting a mirror (just one is enough) to the correct height or removing all mirrors solves this problem. Most people are unaware of how hot pipes can become after hot water has been running through them. Even worse, diabetics and paraplegics in wheelchairs may be unable to feel scalding burns from unwrapped pipes beneath a sink! Doorknobs and locks that require a grasping, twisting or pinching motion to operate may be difficult for people with joint problems such as arthritis or carpal tunnel syndrome. A door lever with a push-button lock is the best solution. These are just a sample of issues that are extremely easy to fix, but are legitimate barriers to people with disabilities. So, your question now, I am sure, is how liable does this make me? A common misconception among business owners is that only the landlord is responsible for providing accessibility. The fact of the matter is, since the store front is the most visible aspect of a business property, most often only the business owner gets slapped with an accessibility lawsuit. However, anyone who has ever been responsible for any part of a commercial location shares in its liability. Anyone who has done construction, occupied, sold, leased or managed a business location is potentially liable. Even the architect is liable for buildings built after 1991. Landlords are always responsible because most “triple net leases” do not cover renovations; only repairs. On the other hand, tenants are always responsible for providing access to their occupied portion. An example might help: An improperly placed accessible parking space can generate almost thirty violations. Failure to have any accessible parking at all can be more than forty violations. At $4000 for each and every violation, just that one issue can bankrupt a small business. The complexity of the ADA requires an expert to investigate the site. But because all accessible elements are visible to the unaided eye, neither landlord nor tenant is safe. Responsibility for the ADA is much like asbestos or a leaky roof… waiting only delays the inevitable. In a worst case scenario, suit will be brought against a business for not being compliant. Time and money spent on a lawsuit is not recoverable. Defending against accessibility lawsuits is difficult because almost all of the fixes are considered “readily achievable.” Given that the ADA has been around for almost two decades, judges tend to throw the book at non-complying businesses. So what is the best thing to do? The first step is to hire an expert to evaluate your site. ADA laws change all the time and knowing the liability of a site (before or after you lease, after you’ve made renovations or even if you’re only considering to do renovations) allows you to take corrective measures before things get out of hand. What was allowed five years ago may no longer be. At the very least, an ADA expert can tell you what the quickest steps are to limit your liability so you can stay in good shape. Yours Truly Accessibility Corporation has years of experience providing accessibility inspections and reports. Got questions about accessibility? Send an email to help@accesssolutionllc.com or call us at 1-866-982-3212.